Ministry of Health in United Arab Emirates is one such wonderful great organisation with mission to enhance the health of individuals and societies in UAE through the provision of comprehensive and excellent health services , in a healthy and sustainable environment , through implementing policies , legislation , programs and effective partnerships locally and internationally. 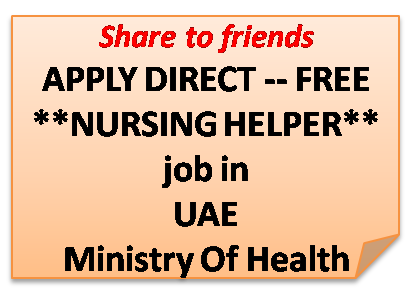 Here is an opportunity to become a Nursing Helper in UAE Ministry of Health. I suggest our dear professionals and non professionals, with or without experience; to try to get a job in MOH in UAE. Simplly CLICK HERE to reach the application submission page and apply directly, free of cost. Please share to your FRIENDS and relatives also.